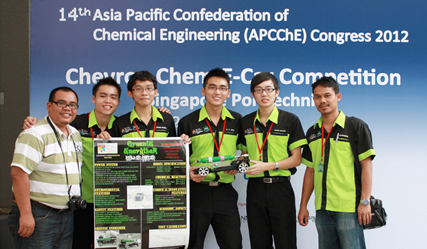 BANGI, 28 Feb. 2012 – A four member team from the Chemical Engineering Department of the Faculty of Engineering and Built Environment has made UKM and the nation proud after being declared the runner-up in the International Chevron Chem E Car competition in Singapore last week. A total of 16 teams from universities in Singapore, Iran and Taiwan apart from Malaysia took part in the competition held in conjunction with the 14th Asia Pacific Confederation of Chemical Engineering Congress held at the Singapore Polytechnic. The team comprises Cheong Jiun Soon as leader, Ong Kah Chien, Yap Jun Sheng and Lee Pak Hoe. They were supervised Dr Mohd Shahbudin Masdar. The team was selected to represent Malaysia after winning the 7th Chem E national level competition held in Petronas Technology University on Mac 17 last year. They had then beaten more than 30 other groups from various institutions of higher learning in the country. The team named “Greenie Energizer” received a certificate and a cash prize of USD700. The team from the Nanyang Polytecnic of Singapore won the competition and received a cash prize of USD1000. Another Malaysian team from the Petronas Technology University won in the newly introduced ‘car speed’ category while the poster category competition was also won by Singapore Nanyang Polytechnic. The Chem E Car competition is an annual event both at the national and international levels organised by Engineering Institutes specifically for chemical engineering students to guage their capability and creativity. The winning car is based on its ability to move towards the finishing line powered by chemical reactions and carrying a predetermined load. The competition thus afford the students to test their ability in applying their knowledge of chemical reactions. The UKM team had used cell fuel technology with the assistance of the Cell Fuel Institute of UKM to create the chemical reaction to power the car. In cell fuel technology hydrogen from the anode electrode will react with oxygen from the cathode electrode to produce electrical power and water with the help of a catalyst. By controlling hydrogen emission through a controlling valve, the mini car can be moved to a distance required carrying the load given. The team’s mini car was able to move to just 0.6 of a meter to the finishing line carrying a 300 ml water load. Their supervisor Dr Mohd Shahbudin Masdar said the competition had not only tested their capability but had imbued in them the sense of pride in representing UKM. Dr Shahbudin expressed his gratitude to all faculty members who were involved directly and indirectly in the efforts apart from the management of the Faculty of Engineering and Built Environment, the Cell Fuel Institute and UKM for their unstinting support thereby enabling the team to compete both at the national and international levels.